Lankan cricket which looked as if it had recovered from their initial setbacks plummeted into the doldrums once again when the English openers Jason Roy (112 not out) and Alex Hales (133 not out) took England to a target of 255 with nearly 16 overs to spare and hammered Sri Lanka by 10 wickets to win the second one-day international at Edgbaston. It was a complete contrast from the first one-day international that ended in a tie on Tuesday. Now the Lankan cricketers are limping back to action this evening (today is a day game at Bristol). On wicket that promised easily over 325 runs, the Lankans scored a meager 254 for 7 in their allotted 50 overs. Now the question posed by cricket insiders is – “Are they on a rebuilding process. We accept that situation, but, what happened on Friday was in bits and pieces. They questioned the wisdom of including players in the calibre of Farveez Maharoof, Upul Tharanga, Suraj Randiv and Seekuge Prasanna. All these cricketers are over thirty years of age. If it is a rebuilding process, the accent should be different. They dropped players who should be in the process and brought in older players, even so they could not reverse margins. “Now it is up to us to do the best with the available resources and I hope that we would come up with an improved performance this evening”. Sri Lanka‘s captain and vice captain – Angelo Mathews and Dinesh Chandimal were hobbling around with hamstring injuries. In spite of his injury Chandimal kept on going for short singles and the result was that he was run out when he found it difficult to turn around after attempting a suicidal single. Nevertheless Chandimal and Mathews scored 44 and 52 respectively while putting on an 82 run stand for the 4th wicket. Meanwhile Mathews opened bowling during the first ODI and bagged the wicket of Jason Roy and Joe Root before injuring himself did not bowl in the second ODI. It was not clear about the intensity of the two injuries so far. The two batsmen will face fitness tests prior to the game this morning. 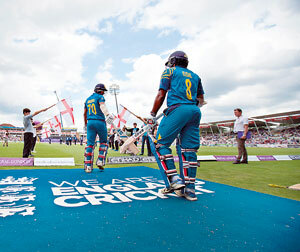 This victory was also just the sixth time England had won an ODI by 10 wickets. “I think the chase was absolutely remarkable,” Said England captain Eoin Morgan who told reporters after England’s first win in five ODIs following three straight defeats in South Africa and the Trent Bridge tie. “I’ve never experienced anything like that, where we were so in control without being reckless,” the former Ireland batsman added ahead of Sunday’s third match today. Sri Lanka captain Angelo Mathews was in no doubt of the England first-wicket duo’s quality. “They are explosive openers and if you give them a chance or a start then that’s what they can do; they can destroy any attack,” he said.